While many of my readers have met me, very few people have actually met my husband. Even fewer have been lucky enough to speak to him! My husband is not the most sociable person in the world, preferring to leave that part of life to me, and he takes a long time to warm up to new people. But without him, K-N-S Farm could not exist. The “S” in our name stands not just for Steven, but for SUPPORT. My husband and I are one of those fortunate pairs that found each other early on in Highschool. We stuck together like glue, even through some pretty terrible times. We grew together, sometimes with friction, but we found the appropriate middle ground time and time again. And time and time again, we defeated adversity and moved on to the next step in our lives. One of those steps was what brought us to where we are today, and as I said before, it absolutely would not have been possible without him. We started with poultry on our little farm – he brought home a box full of random chicks from the feedstore after hearing me lament my lack of animals to care for. Though he’d never before handled a live chicken (and to this day, holding a wriggly feathery bird is not something he’s a fan of) he gamely helped me care for them and eventually move them to their outdoor pen. He celebrated their first eggs with me and peered with interest into the cheap incubator he brought home as our first chicks hatched. We were still newlyweds at this point, and our new adventure was strange to him – but exciting! As I browsed and participated on chicken forums (where I coincidentally ended up meeting my best friend as well), I found myself drawn to posts from people with pet goats. I began to do as much research as I could on goats, especially dairy goats. I’ll tell you a secret – I despise milk. I have since I was a child. To this day I do not drink milk. However, Steven is a huge fan of milk and goes through impressive quantities, so I felt some little dairy goats would be a perfect addition to our flock of chickens and ducks. Mother’s Day was approaching, and though we have no human children, I felt that was a good enough excuse to show him some little goats I’d found on Craigslist. My husband has always indulged pretty much my every whim, even when it travels into a world he has had absolutely no experience with. We drove home with two wild-eyed goats standing in the backseat of a Chevy Malibu, and when we arrived home again, he bravely held onto the horns of the female goat while I did my best to milk her out into a pickle jar. I wonder if he had any idea what spark had just been struck. When we chose the name for our farm, he was the one who chose the simple, K-N-S. He wanted to be represented, and rightly so – without him, there would never be a farm. There would be no goats or chickens. There would be nothing. His support continued as we chose a new place to live, one specifically with enough room to grow our goat herd. He drove the posts for our fencing and nailed together our shelter. When I wanted to add ponies to our herd, it was him who bravely pulled the frightened and unhandled pony onto the trailer, trusting that I would know what I was doing when we arrived home with it. When a goat died and needed to be buried, it was him who dug the hole. 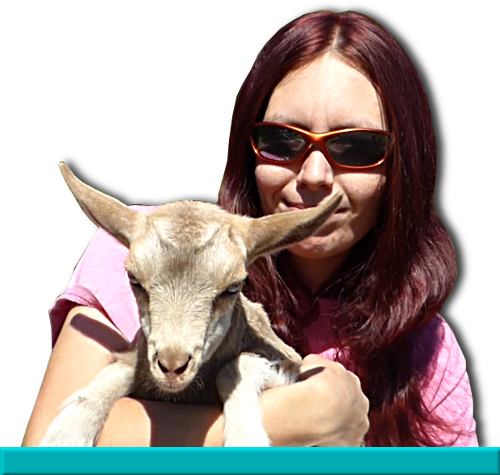 When I wanted to buy a new goat, it was my husband who drove the necessary distance to pick it up. When I drug him to friends’ farms to help them, he came and did his best, and even made a few friends in the process. Never did he balk, or argue, or debate. Trusting in my ability to balance everything we were and are doing, my husband only gives support. When we began to work at the dairy, he came along with no complaints and was interested in what they were growing. However, as we began to discuss moving there so that I could take on the job of stock management, he had some trepidation. As I mentioned before, my husband is not a social person. My husband is always ready to help out when needed, but it has lead us to trouble before. We have, unfortunately, lived with other people who would expect too much of him, until the point it became exhausting and leads to conflict. Other people often have trouble understanding him as he is – they see a large quiet man who does not wish to socialize or talk much, and begin to believe that he is always angry, or dislikes them, when in reality, the poor guy just wishes to be left alone in most cases. We wanted so badly for this situation to work, as our current home was in a very bad location and I was becoming very afraid of being alone while he worked all day. So we did what we could to prepare the owners of Honey Doe Farm for the peculiarities of my husband. And honestly, I believe it worked. Certainly there were some issues in the beginning we all had to work out together as we learned each other, made much more difficult by the stress both Steven and I were under due to our home burning down before we could make the move. It took us all time to settle in, but I must give the farm owners here more credit than I could express in words – where others would have just become frustrated and thrown their hands up in surrender, they pushed through and did their best to understand. With time, we found our footing, and I do believe it’s been quite the success story. In fact, the farm counts on Steven as much as I do now – he now handles the majority of our hay shipments, everything from unloading to refilling the feeders. Barn cleaning too lays upon his shoulders every year, a hard difficult job that he does without complaint, knowing how important it is that we have a clean barn for kidding season. In fact, last year he laid down rules to ensure the barn’s build up of deep bedding through the winter was done in a fashion that would enable him to clean easier. It’s him who scolds us when the hay barn is closed improperly and the goats break into to cause chaos. And when we make mistakes and do silly things like buy a herd of sixty untested Toggenburg goats, it was my husband who was the most against it, warning us what a risk we were taking. Even though now he may not know all of their names, he still buys apples and treats for our goats. Despite now having a nice car, he still will put a goat inside – though it must be crated! Regardless of how busy our lives have become, he always has time for what the farm needs. None of this could be possible without Steven. Though I may be the active face of the farm, the person everyone meets and knows, I pale in comparison to him when it comes to importance. If it wasn’t for him, everything I do could not be done. So if you ever happen to catch a glimpse of Steven when you visit the farm, or have the chance to say hello, remember that you are meeting the true support beneath K-N-S Farm – even if he barely says hello back before vanishing out of sight!